Trompe Loeil is back for this month’s Spruce Up Your Space with The Arctic Cave Skybox! 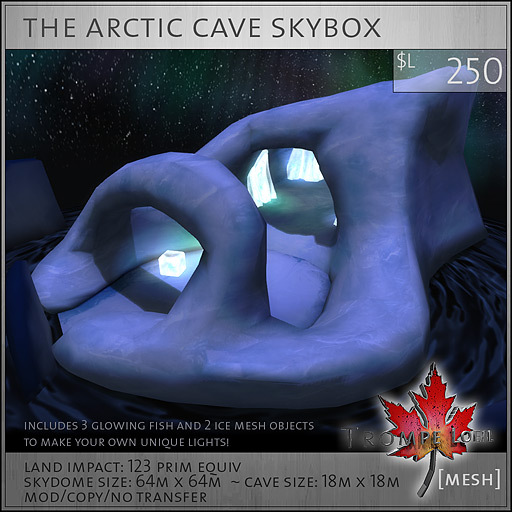 This icy retreat features all-mesh construction, glowing fish trapped in ice for lighting (including 3 colors of fish and 2 ice models for making your own light arrangements), a ground version of the Arctic Cave and a privacy-scripted Skybox version! Only $L100 during the SUYS weekend of Dec 17-18 and only at Trompe Loeil!